A multifunction knob means fast and easy navigation in the software and setting of parameters. Setup time is reduced with fast manual positioning of large and deep workpieces using a joystick. The powerful motor enables very fast cutting of all materials. 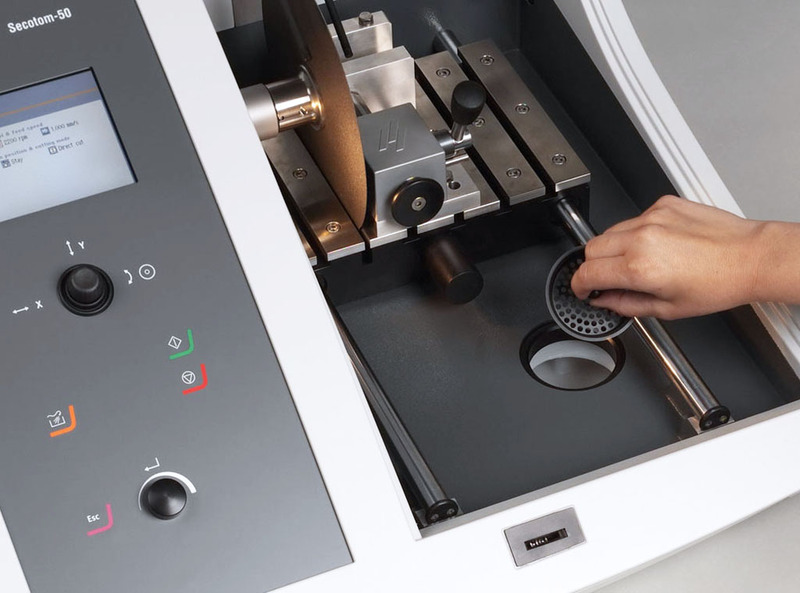 Secotom performs precise and deformation-free cutting of metals, ceramics, composites, sintered carbides, electronic components, crystals, biomaterials, minerals, etc. 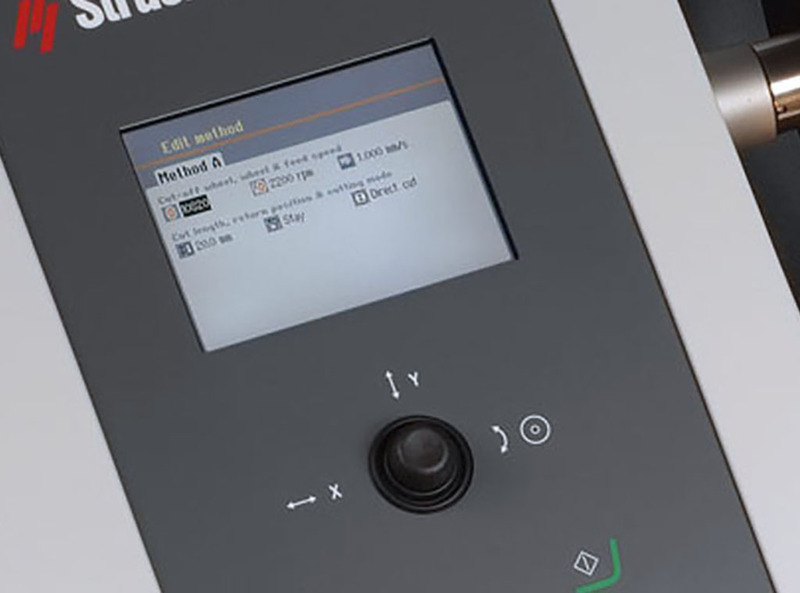 The Secotom machines are designed for optimal user friendliness with a large control panel and color display for easy operation, along with intuitive software and easy access to the cutting chamber. No programming is required, and there are no complex menus. The joystick can be used for fast and precise positioning of the workpiece as well as automatic height adjustment, enabling utilization of a large variety of cut-off wheel sizes. The large cutting table is made of corrosion-resistant cast aluminum with stainless steel bands. Front positioning free of the cut-off wheel means easy clamping, and 8.0 mm T-slots provide maximum clamping flexibility, allowing the use of a wide range of clamping tools. 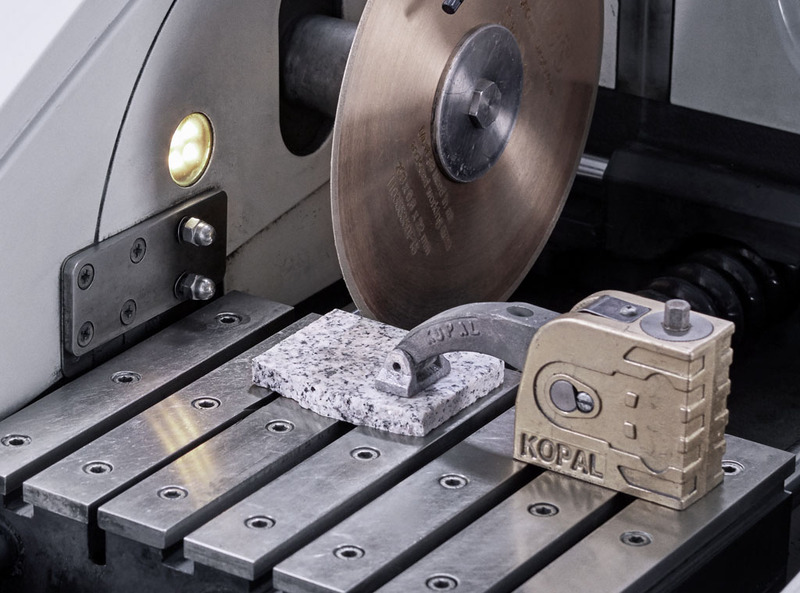 ExciCut is used on Secotom-50 when cutting extremely hard materials that cannot be cut directly. ExciCut operates by moving the cut-off wheel up and down as the cutting table moves forward. This ensures a small contact area between the cut-off wheel and the workpiece, provides better coolant access, and prevents thermal damage to the workpiece. 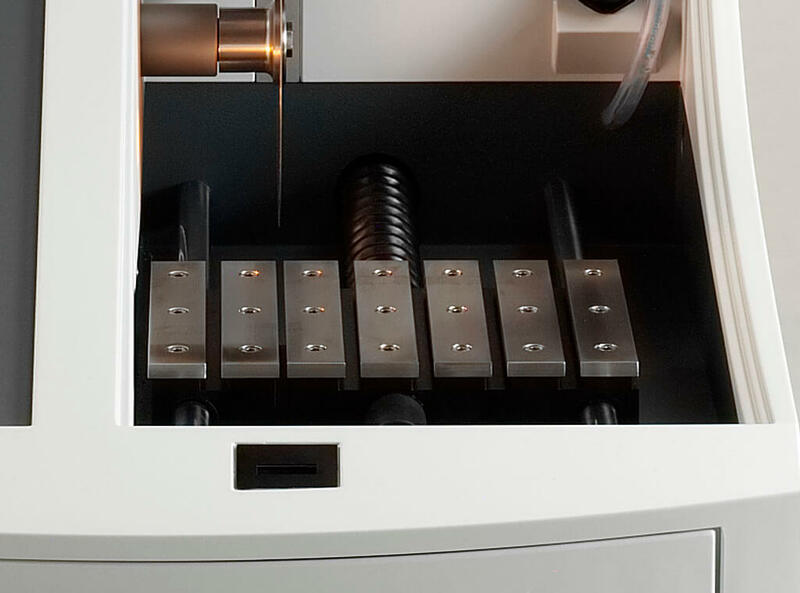 The feed speed can be preset and controlled in the range of 0.005 to 3.0 mm/sec. 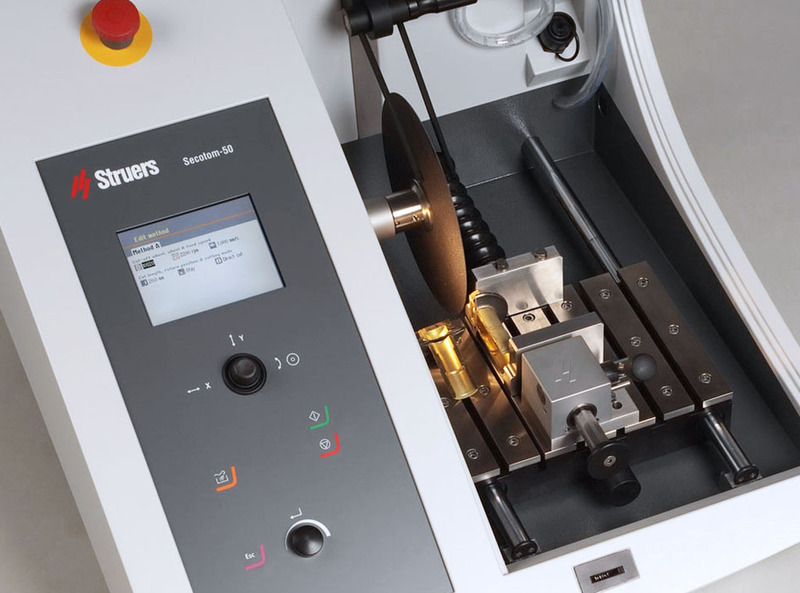 This wide range allows delicate workpieces to be cut. If the feed speed is set too high, resulting in motor overload, OptiFeed automatically reduces the feed speed to an appropriate value. As soon as the load on the motor is reduced again, the feed speed is increased to the preset level. The spacious cutting chamber ensures optimum accessibility. A powerful LED lights up the cutting chamber adjacent to the cut-off wheel spindle and makes it easy to follow the cutting process. For collecting and easy cleaning of the big particles from the cutting process, a drain basket is placed in the cutting chamber drain. The automatic X-table optional accessory means the Secotom-50 can be used for serial cutting in order to reduce cutting and operator time. 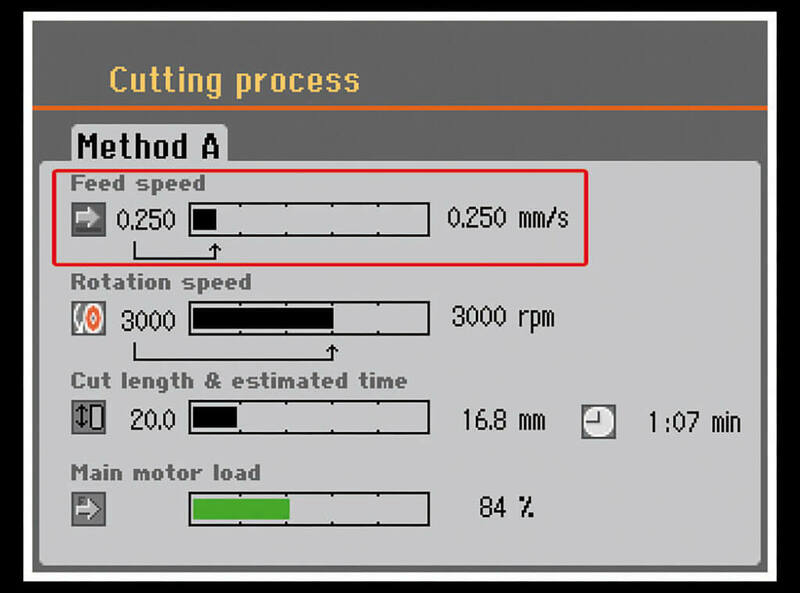 A cutting mode for slices of equal thickness or a mode for cutting of up to four slices of different thickness can be chosen. The cut-off wheel speed can be varied from 300 rpm to 5,000 rpm, in 100 rpm increments. This enables a more accurate choice of wheel speed for different cut-off wheel types and sizes. The cutting length can be pre-set between 0-190 mm and adjusted in steps of 0.1 mm. This gives the operator the freedom to attend to other tasks while the machine is cutting. The operator can monitor the cutting motor load throughout the process on the control panel display. Secotom is available in two variations, see specifications for details. Tabletop, precision cut-off machine with moveable cutting table, and variable speed. and clamping tools are ordered separately. Specification: 200-240 V / 50-60 Hz. Tabletop, precision cut-off machine with moveable cutting table and variable speed.